This week Northeastern University celebrated the official opening of the Interdisciplinary Science and Engineering Complex with an opening symposium featuring a keynote speech by National Science Foundation Director France A. Cordova. The morning’s events included remarks from several elected officials – US Senators Elizabeth Warren and Ed Markey, US Representative Joseph Kennedy III and Mayor Martin Walsh – as well as Northeastern President Aoun. Many of the speakers remarked on the magnificence of the building and its embodiment of the University’s commitment to research and the future. Throughout the morning, we heard several comments about the urgency of interdisciplinary research – to explore our world’s most complex challenges. 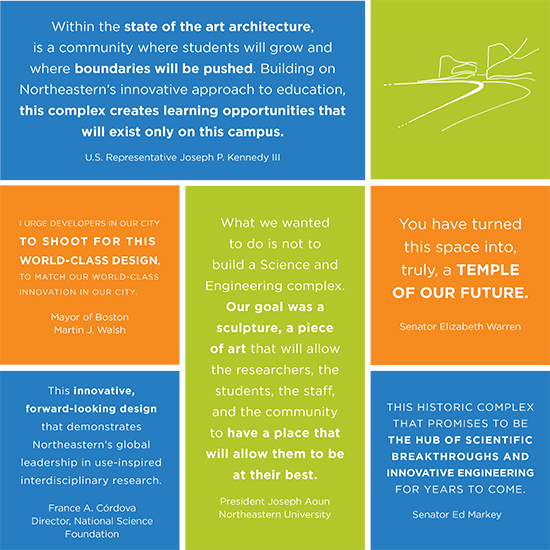 We believe the design of this building sets the stage for incredible discovery and collaboration for years to come. Dr. Cordova spoke at length about the concept of convergence, which draws on the deep, integration of knowledge, techniques and expertise from multiple fields and said, “The ISEC will put in to practice the concept of convergence.” We can’t wait to see what scientific discoveries happen within the walls of the ISEC.